This new build facility provides a modern resource centre and respite care home for disabled children and their families. We worked closely with the scheme architects to ensure that the new buildings are well sited and to create a seamless interface between the internal and external environment. As part of the design development, we prepared ground modelling solutions to demonstrate the integration of built form and landscape. 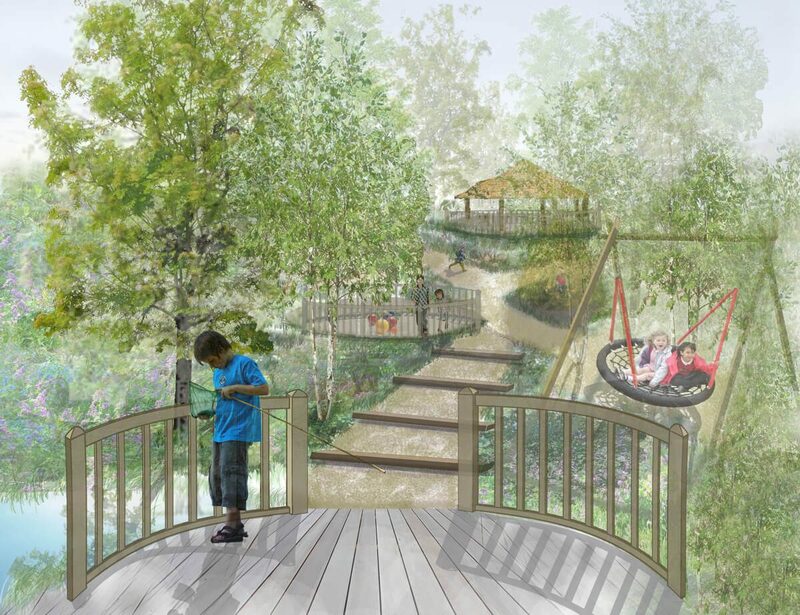 The landscape scheme seeks to create a stimulating environment through the creation of a series of outdoor ‘rooms’ providing spaces for contemplation, social interaction and play. Planting is used to create movement, scent, colour and attract wildlife to the grounds. The sensory experience is heightened through the use of special hard surface details such as a mosaic, timber strips, and illuminated coloured glass to enhance the character of particular areas. A circuit for cycles, trikes and scooters forms part of the play facilities and features ‘rumble strips’ of different materials and colours to expand the ways in which it can be experienced.